Get to know the patient, their needs; then build a care system around them. Since we cannot separate the disease or clinical condition from the person, coordinated care begins with the patient. Success depends on getting to know them, their clinical conditions, challenges, preferences, passions and goals. For 5% of the United States population that consumes 50% of the healthcare spending “super-utilizers”, getting to know them is critical in patient recovery and generating shared savings. A study done by the Institute of Medicine estimated the United States could save $271B in 2014 if we reduced uncoordinated care. It would improve lives of people like the 46-year-old female described in the study. She had a cardiac condition, chronic obstructive pulmonary disease and depression. In 12 months of uncoordinated care, she had 185 prescriptions from 34 prescribing physicians and used 21 different pharmacies. She had 395 separate medical events including 45 emergency room visits, 147 outpatient visits and 85 physician visits from 54 different treating physicians. The traditional fee-for-service reimbursement models do not reimburse providers to coordinate care. Managed care health plans and the new performance reimbursement providers offer coordinated care, yet they bear the cost risk of the services while hoping it is offset by shared savings. The options of “no reimbursement” or “full risk” for coordinated care may explain why the 46-year old woman could have 395 separate medical events in a year. Her unmet needs are far beyond the scope of what physicians (the 54 that she saw) are equipped to help with or paid to provide. 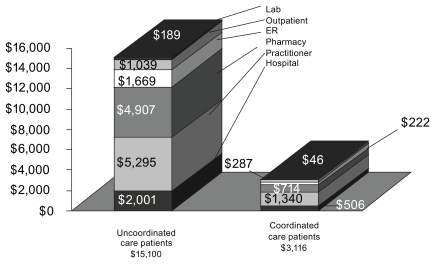 The result, the same IOM study demonstrated the most extreme uncoordinated care Medicaid patients cost $15,100 compared to $3,116 for those with better coordinated care. As we develop the new bundled (Bundled Payments) and global (i.e., Accountable Care Organizations, Patient-Centered Medical Homes) reimbursement models intended to replace traditional fee-for-service, coordinated care approaches need to be developed for “super-utilizers”. The good news is that innovative organizations with global reimbursement models have proven this approach will generate shared savings. Montefiore, Banner, WellMed, Camden Coalition and Oregon’s Coordinated Care organizations are improving patient outcomes and generating millions of shared savings with comprehensive coordinated care. An Institute of Medicines study on services provided to patients after a hospital stay showed that if we adopted the practices of high performing providers, Medicare cost during this period would drop 73 percent. It’s getting to know the patient and building a virtual private care system around them. Care Decision Making – often requires many tests, opinions and developing viable options for the patient to choose. Each option (i.e., palliative care, cancer treatment) requires understanding diagnosis, prognosis and treatments as well as the patient’s particular social, behavioral and basic needs. Social & Behavioral – Patient-About (family & friends, stress, career), Lifestyle (activities, roles in lives of others), Behavior (nutrition, social interactions, physical activity), Preferences (change acceptance, Advanced Patient Directives), Patient Activation (understanding conditions, how to take care of them, medication adherence), Technology Adoption (use of mobile devices, blood pressure cuffs, web support groups). Recovery Management – Recovery Team (clinical providers, care givers), Recovery Goals, Recovery Plan (treatments, procedures, other activities), Recovery Monitoring (what?, who?, how? ), Recovery Protocols (clinical pathways, event triggers, notification & associated actions). The findings from innovators like Montefiore ($23M in Shared Savings in first year) and Banner ($13M in Shared Savings in first year) that patient outcomes are tied to addressing “super-utilizers” social, behavioral and basic needs. Patients often place caring for themselves after addressing their unmet needs (i.e., stress, depression, no money for food, clothing or transportation). The success of Coordinated Care (and the new reimbursement models) will be based on determining which patient unmet needs are preventing recovery and then help to address them.